I have always found Jamie Oliver to be charming and adorable. When I met him a couple of Summers ago, his first words to me were "Awright, sweet pea, ow yer doin'?" and I think I almost swooned. Susceptibility to cheekiness in a man is one of my weaknesses and Jamie is a master of cheek. Although his career had already taken off by the time I left Britain in 2001, his star was still on the rise and at that point he was known for little more than being the Naked Chef, a cheeky young chap with an upbeat, popular tv cooking show. I have kept half an an eye on Jamie Oliver's career ever since and I have been rooting for him as he has ventured away from the kitchen and into the community where he has been putting the power of his success and fame to use for a greater good. After one too many lunchtimes spent trying not to gag on gristly meat or lumpy banana custard I could certainly empathize with Oliver's attempts to improve the quality of meals in British schools. And although I missed the accompanying TV shows, I was encouraged to hear about the work he was doing with his Fifteen project, helping disadvantaged young people to get hands on experience in a working restaurant kitchen. Recently we booked a last minute 2 day getaway to North Cornwall, the wild landscape of all my happy childhood holiday memories. We managed to get a room (albeit one that had not been remodelled), at The Hotel in Watergate Bay, for an absolute steal, and when I learned that Fifteen Cornwall was only a minute's walk away I jumped on a reservation for dinner. Fifteen takes the upper floor of a building nestled on the periphery of Watergate Bay's stunning sands. 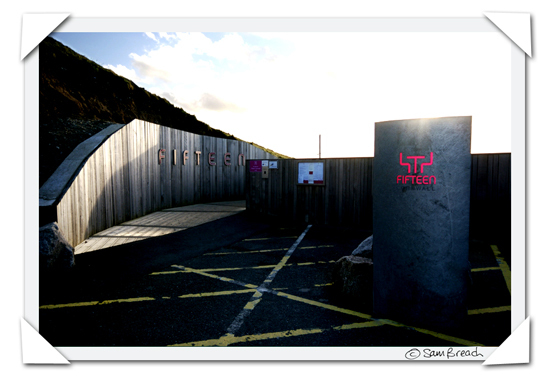 At the far end of the beach side car park the dark grey of a slate monolith, branded with a neon pink fifteen, beacons you towards a wave of worn wooden panels that drift you further towards the entrance, down the steps and to the front door. Inside the restaurant it's pretty, loft-like and open-plan with distant views into the kitchen. The pitched roof is held up with white pillars swarming with pink butterfiles and dozens of warm lights drop down from the centre of the ceiling like bulbous teardrops on strings. For those sat next to the window, as we were, harsher white LED lighting takes over from the softer golden globes and with all the reflection bounced back at you in the panoramic bank of windows, when it is dark don't actually expect to see anything at all of the sea outside. The menu is set at £50 per person. For this you will get five courses, or six if you count the bread and "the biggest green olives from Puglia" you are given when you sit down to peruse the menu. If you would like a wine pairing (of course, we did), it will set you back a further £40 a head. First up were two each of four little porcelain soup spoons, one bearing a mouthful of Scottish girolles, aged pecorino and that world-weary accompaniment, the truffle oil and the second a honey roasted fig that had been dabbed with a little Vulscombe goats cheese and anointed with 12 year old balsamic. Whilst these tiny tastes were pleasant, they did nothing to really whet my appetite. The next course, a self-described "Fantastic salad" of mozarella di bufala, prosciutto San Daniele and "Newlina's funky leaves" (salty and perfectly dressed) was hindered by the addition of a large char-grilled and decidely yellow-looking "Italian white peach" whose overbearing sweetness knocked out the salty appeal of the other ingredients. I pushed my peach to one side, concentrated on the savoury elements and felt my satisfaction level rise as I did so. At this point I am wondering about the trainee chefs whose skill set so far seems to amount to little more than the assembly of ingredients. Thankfully they got cooking during the next course where we were given a choice of a standard vegetarian Ricotta gnocchi with tomato and pesto which Fred ordered and the Cornish Seaside risotto which was my preference. The menu claimed that my dish contained monkfish, tuna, cod, sole and cockles (just the one). The seafood didn't really have its chance to shine because of the pungent presence of whole fennel seeds in the pangritata, a crispy breadcrumb topping. Swimming with the fishes, underneath the crunchy surface, was a thin, spicy tomato sauce studded with a meagre number of separated grains that were more like orzo than rice. Despite all of that, it pains me to say that this was the most interesting dish of the evening. When the main courses arrived and I dipped my fork into the 'Crispy line caught john dory fillet, crushed charlotte potatoes, Rob's tenderstem broccoli and salsa rossa cruda' and took my first mouthful, I suddenly became acutely aware of the tedium of eating a meal at Fifteen Cornwall. Everything on my plate was bland and uninspired. The line that caught the fish must itself have been crispy, because the skin of the fish, soggy, unappetizing and as grey as the slate lining the rugged cliffs nearby, certainly was not deserving of a description suggesting any kind of crunch. The salsa tomatoes sitting on top of my little aquatic friend were tired and lackluster whilst the potato mush he was sitting on - don't even get me started on that pile of absolute boredom. I could make better crushed potatoes with my eyes shut from the spoils of a fridge that hasn't been shopped for in almost five weeks. Fred didn't fare much better with his lamb, which although in itself was a tasty piece of slow roasted shoulder, wasn't helped any by its rustic presentation and the undercooked vegetables accompanying it. Have you ever tried eating a raw, save for the chargrilled outer leaf, whole leek? No. Not possible is it? If a la carte had been an option, we would have left the restaurant, probably, but instead we soldiered on to dessert since we'd already paid for it. Fred didn't want anything further except a coffee, so I ordered the two sweet options just to try. You can't get much more pedestrian sweet choices than a chocolate thing or a lemon tart thing, but that was all they had. So I removed the creme fraiche from the chocolate torte and replaced it with the glob of Cornish clotted cream that was meant to partner the lemon tart. I toyed with nibbling on the advertised stars of the show, but mainly just ate the clotted cream. There is never anything wrong with clotted cream. Like the rest of the meal, the problem with dessert was that it was median, middling and any manner of other m-words meaning mediocre. This restaurant has no soul. I am so glad Fred ordered coffee, because they served it with some vanilla fudge which, of course, I took possession of immediately. It was fantastic. The best fudge I have ever eaten in Cornwall (and, yes, I do have a rather long history of experience in that department). As we paid the horrendously huge bill which I believe might have contained a 4 and a couple of zeros if it were ever to be translated into the American $language, I remarked to our server how much I loved that fudge. "It's the best thing I ate all night" I blurted out, somewhat enthusiastically given that by adulating it, I was also relegating the status of everything else we had eaten to less interesting than candy. Minutes later I happily listened to him telling the Chef who made it how much I loved it and hence they gave me a couple more pieces that I wrapped up and took home for breakfast a midnight snack. Fifteen is well meaning. Everyone we met was lovely. When I asked to purchase a bottle of sparkling water to take home with me, they kindly gave it to me for free. Our waitress was a sweetheart, familiar and friendly. The place felt comfortable. But Jamie, I hate to have to say this to you, Fifteen simply isn't good enough. You are asking your customers to drop fifty quid for a meal, and those customers are more than just charitable souls, they deserve some tasty tucker. Apart from that fudge, nothing your students served was utterly delicious when ideally every mouthful should have made us swoon. Almost everything we ate tasted like it had been made by a less than proficient home cook doing a not very good job of following of your recipe books. It all seemed so amateurish. Jamie, I love the idea of Fifteen - but what is the point if you aren't showing these youngsters how to create food that is capable of tasting truly fantastic. They need to know how it feels to shudder with joy as nirvana passes their lips. And your supporters deserve that too. This review was a first impression and I'd like to think it was a one-off bad night, but I'm not sure I am buying that theory. Well that is a shame Sam. I would have hoped for more too. Lucky you to be in Cornwall! I fell in love with that area. Sorry about your experience at Fifteen...but I've heard quite a few share the same thoughts recently. Perhaps he needs to put a bit more attention into it. Similar things have been said about Fifteen in Melbourne. It's a pity given it's a fantastic project. On another note, I'd love to visit Cornwall! Fantastic idea, but this place needs some work. I was there on a photo shoot last year. I was a little shocked when all of the plates I photographed were extremely italian and used few local ingredients. Maybe it was just an oversight, but I was looking for more regional flavor or at least products. The antipasti starter was good, there were some local carrots etc, but the highlights of the dish were again, not local. As for the rest of my meal I haven't the faintest memory as to what i ate. The saddest part about it all was when I had all the cooks autograph a JO cookbook. One of them tore the place to pieces! I watched the TV series and the idea was great, shame it didn't work out. Not good news and disappointing. I have plans to make the hubby take me to fifteen in London for my birthday in March next year when we have a flying visit back to the UK. Was even considering booking now as I know how these places get booked up. Might rethink fifteen and go for the Ivy instead. But I do love JO. I am currently reviewing all the top steakhouses of Boston and fear the steak in the UK will never compare when we go back. They do some great ribs here too. Anyway, I really wanted to ask how the hotel was - did you get a decent brekkie? Always an important question when considering a hotel or B&B and that one looked so cool. Ok, so just finished reading the full review. Too bad about the meal. It is a fantastic idea, but the food does need to be good - not just good - great, for it to work. I hope Jamie's listening! I think if Jamie could read this he might be a tad disappointed and do something about it; or is it just a case of you can't make a silk purse out of a pigs ear as far as great chefs go! however maybe the person who made the fudge is destined to go far. That's a real shame, I respect what Jamie Oliver tries to do a lot but this is the second time that I have heard this about Fifteen in Cornwall. If I ever holiday in Cornwall I'm planning a trip to Rick Stein's restaurant in Padstow which looks great. Well done, Sam. You put 'em away. Ka-pow. Your whole piece was full of crispy lines. Oh dear. I supposed the fifty quid was more for Jamie than for the meal. It seems worth it to me. Well, almost! You've made me a sad panda. It's really too bad you had such a bland experience at Fifteen Cornwall. I was looking forward to reading this article, as I adore Jamie Oliver and thoroughly enjoyed "Jamie's Kitchen", the show that documented his first class of students and the opening of his first Fifteen restaurant. Thank you for satisfying my curiosity. I'll be sure to give the Fifteen restaurants a pass when I travel to England later next year. In some ways, I think you may have been hoping for too much, although the high price for the dinner undoubtedly served to generate those expectations. The Fifteen restaurants are essentially teaching kitchens. Oliver's program takes fifteen disadvantaged students (and I mean disadvantaged), puts them through a six month crash training course, then drops them into the restaurants for a year of hands-on experience. Of his first crop of students, only five went on to succeed as professional chefs. Junior Thomas Kellers these are not. Given that your dinner was served entirely by trainees, I completely agree with your dissatisfaction. Being charged 50 quid a pop to help these kids learn how to cook is outrageous. That's about $102 USD. The teaching restaurants run by most culinary schools in the States usually charge less than $40 USD for similar tasting menus. If I were you, I'd forward a copy of this post to both the Fifteen foundation and Mr. Oliver himself. Having the only restaurants connected to his name serving meals like the one you describe can't be doing his reputation any good. As much as I applaud his philanthropy, there's no excuse for overcharging for mediocre food. Really brilliantly written, and as you know I'm not all that interested in the subject matter, so that's a serious compliment. I actually ate at Fifeteen (London) back in Spring '04 with a friend of mine. It was one of the best meals I've ever had in Europe (and I've had quite a number of trips across the atlantic)! I remember how everything tasted, from the starter to the dessert...absolutely one of the highlights of that trip. None of the dishes seemed amatuerish in anyway. Maybe it was an off night? Maybe the staff in Cornwall isn't as well trained as in London (which is not an excuse...any "franchise" should hold the same standard everywhere)? It's a great project, but JO really has to pay attention to all of the branches of this restaurant chain. He can't let one down and tarnish the rest. Btw, your reviews get better and better. I just love the fluidity in your writing. And the cheekiness too! Unfortunately, I'm not shocked. I wish I was, cause I'm a huge Jamie fan. At that price, I certainly don't blame you for expecting a memorable meal [and that's 'memorable because it was really good' memorable]. i am sooo glad to read this as it confirms my worst fears... i've always resisted invitations to fifteen, the reason being my following some recipes from the "very talented" chefs there in magazines up and down the country and the fact that a bowl of pasta sets you back almost £20 - an OK price for a big chunk of perfectly cooked beef fillet or a lobster, but noodles? come on! although jamie's was one of the first cookbooks i bought over here, i have grown tired of his "chuck-everything-into-a-pan-from-at-least-3-metres-away" attitude... it may work for somebody who doesn't know his spoon from a fork, but i don't find it very appealing. Friends of ours (Jamie fans I might add) have been to Fifteen in London and they've had a hard time in finding a good excuse for paying an enormous amount of money for what they got in return. She still buys his books, but calls the evening the worst letdown she ever had in London. What a shame. I heard similar things. I dont know if you ever listen to the food program on Radio 4 but they were talking about a lovely little place run by banardos which was a restaurant, although I dont think they had such lofty goals, possibly seasonal and local but a lot more low key. Sounded like it was a bit more successful. Oh, I'm really sorry to hear that. I think Oliver is wonderful. I like his recipes (his focaccia helped me stare down my fear of yeast), like you, swooning is on the menu when he talks or even smiles (yes, American women are total suckers for UK accents), and both the restaurant the push to improve school meals makes him even more adorable. Maybe it was an off night, or perhaps, as you surmised, there wasn't enough passion in the cooking. Anyone can cook; it's simply chemistry. But to do it well? That comes from inside. When I visited London recently, I tried so hard to visit the Fifteen restaurant in Shoreditch. Unfortunately, I wasn't able to visit and reading this makes me think I didn't miss a thing. I wrote Ocean Views from the Cliffs a piece on photos of Cornwall by Will Pearson last week. They reminded me of my native Brittany. Before I read this I was of the thought that I would rather eat at a Ramsay restaurant than an Oliver one, and you've reinforced that for me. The missus and I have just returned from an eating holiday in cornwall to some of the major restaurants. Fifteen is luck of the draw? depending on how good these youngsters are. We had a brilliant lunch 3 courses £18...glad we did'nt have lamb...people struggled with its rubbery texture...but hayho thats how it goes. If you want a good meal go to N0.6 in Padstow We've never tasted anything like it ever...forget Ricks Steins Seafood restaurant it was crap and they have no excuses. Ha ha - I can see it now - a Cliff in Cornwall. Daft jokes aside - you are killing me Cliff. I had a little fit standing outside No 6 in Padstow, looking at the menu and understanding that I would not be able to eat there because there wasn't enough time left - it looked amazing - and it was the same price as fifteen. I am glad to hear it was as beautiful as it looked. Even the best intentions oft go awry... How disappointing. I'd read mixed things about 15. I suppose if the captain is not at the wheel...all hell can break lose! Went to 15 on Saturday last, 2 November, My wife thought the experience was great - I thought the whole thing was a joke - now I am no food expert, but I do know when I am being ripped off - keep Padstow, keep trendy London - for a superb reasonably priced table d'hote (cos that's all you get at 15 without the reasonably priced element) try Beaucliffes in the Porth Veor Hotel, half the price, a few miles south of Watergate Bay. If you want to spend the sort of money you spend at 15, then go to the restaurants in and around the Bray area of the Thames - you might spend big bucks but the satisfaction you get from what you eat is ace. I recently visited Rick Stein's Cornwall restaurant in Padstow in November 2007 and it was amazing. Everything from the food, service and overall experience was something special and can't wait to go back. As locals (lucky us!) we eat there a lot and in general it's great! On one occasion recently it wasn't, and I said so. They were very receptive to the feedback and I do think in general they do a great job. They are now using lots more local produce, and on a good day, you can;t beat it for lunch. Dinner remains a treat for special occasions! I am a chef at fifteen cornwall at present. i was one of the 1st group of trainees down here along with sam who posted earlier (hey sam :) ), i trained for 18 months and graduated with distinction and then went on to work full time as an employed chef from june 2007. I found it most distressing that you had such a bad experience and would be very interested if you returned if your opinion would change? I find it very sad that everyone has now been left with a bad impression after your meal and may never experience dining with us because of it. We have had plenty of very satisfied custermers who have LOVED there meal and return back to us time after time. I appeal to anyone who hasnt yet eaten at fifteen cornwall to come along and make your own mind up and experience abit of the 'fifteen' magic. We have just had the set lunch at 15 during "trainee's week". Before arriving we were not told that our choices were limited to fish as a starter and main course. My husband hates fish but soldiered on anyway. Although we were prepared to be charitable given the reduced price and the fact that this was the "trainees' opportunity to shine", we were expecting a meal that was rather more than just edible. We had a smoked mackerel starter. The fish was leathery and the salad limp and uninteresting. had a particularly unpleasant chewy consistency. We had hoped to arrange further visits when visited by relatives and were attending today to "test the ground". I defence of all the 15 chefs who have left comments (thank you all for stopping by), I would add to my readers - yes - please - make up your own minds. I would also add that I, for one, am always open to giving places a second chance. However - at that price I not sure it is worth the financial risk. Like someone said - 15's meal is the equivalent of $104 for 5 courses about which I can think of little good to say. Here in CA I can go to 2-michelin starred Manresa, for example, where I can get a 18-course tasting menu which totally blows 15 away for $135. I really respect Jamie, but 15 is simply not up to the prices it charges. There was not even one single flash of brilliance during the meal to give me any hope that a return would be worth it. Sorry to have to say it, I don't want to, but that's the way 15 left me feeling. I'm suprised that some people seem so persuaded as to making their minds up after reading one blog!! The restaurant actually belongs to the Cornwall Foundation of Promise and not Jamie Oliver. Jamie doesnt make a penny from the restaurant and all profits go to the charity and back into the training programme. At all times at least 80% of produce used is Cornish, the other 20% comes from italy. There are times when the menu is comprised of virtually 100% Cornish produce. This is predominantly an italian restaurant I am told made with Cornish produce. Trained Chefs always oversee the trainees and as far as I can tell the system works. As a local I have visited Fifteen on more than a few occassions for both Lunch and Dinner. Every single time I have had an amazing experience and the food has been top drawer. Again I would encourage people to make up their own minds. If Dinner seems too expensive then start with a lunch and go from there. I'm sure you would return for Dinner. A three course lunch starts from a more resonable £18. Give these trainees a chance they are making amazing steps in their lives, many struggled at school and have few prospects for employment in Cornwall. See this as not supporting Jamie Oliver but supporting the young disadvantaged people of Cornwall. I am really disappointed at the reaction to one review about 15. It seems that people are confused about 15 and this is made apparent because it is NOT Jamie Oliver's restaurant. He makes no profit from the restaurant. He set up the idea to give under-priveledged young eople the chance to become chefs. The reason the cost is high is to invest money in the young trainees who are accepted on the programme. I have eaten there 4 times now- lunch and dinner and visited their fabulous farmers market. Each time I have had at least one dish which has blown me away. Each time I have seen a good use of local ingredients. And each time the view of the beach was awesome. On one occassion we took my two chidren- both under 6 years- and they had a brilliant time with the excellent and welcoming service. Mr Sanderson and Poowits - thank you for taking the time to stop by making the point it is not Jamie Oliver's restaurant. This is something that clearly doesn't come across when thinking about the Fifteen chain. I agree that the service is very friendly and the beach view is fabulous during the day time. I also agree that people should make up their own minds. Of course, if they can afford to. Not all the comments are negative, btw, and several of them are based on experience. I think readers will be astute enough to make up their own minds. Also - I am always happy to support initiative like this. In fact I almost wish I had just given $400 to the charity without having to sit through the tedious food. Whoever it is that is running Fifteen has the responsibility of teaching those young people how to cook. That person owes it not only to the customers/supporters, but to the young chefs too. On my visit, that was sadly not the case. Everything was of an average or lower standard. I think many of you have missed the point. We all know that Fifteen has a changing intake of completely untrained young people every 12 months. They are going to make mistakes but hopefully their mistakes will have less of an impact than previous life mistakes. A meal is over in an hour or two, whether good, or bad, but hopefully the benefit to these young people will last a little longer. No one around here *wants* Fifteen to fail, believe me. I didn't make my critique up - why would I? Would it be 'fair' of me to base it on anything but the truth. Everything I mentioned happened to me. I read The Times Article you speak of and it sounds like things have improved since my visit. I hope they keep up the good work. It seemed to me the award was given bt a Tourist Board not the paper itself and that the Times was just reporting on it. They only gave it 8/10 so room for improvement still. WOuldn't it be nice if England's best restaurant got 10/10? Sam Lounds - thank you so much.